Laney's making a big transition tonight. In preparation for Jessica's arrival we've finally got Laney's new room finished and tonight will mark her first night in the 'pink' room in her BIG bed. And I do mean big. 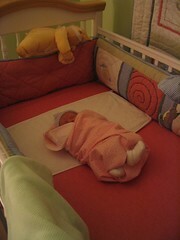 She's going from a crib to a queen-sized mattress. I had a very nice queen-sized bed in college that's still in good shape and we wanted to have one good adult-sized bed should we ever need one for company. And since Laney's new room is quite large it doesn't take up a lot of space. I'm proud of her though. It's still early in the evening, but thus far she's gone to sleep just as she normally would. My only concern is on the occasions when she wakes up in the middle of the night (as she often does.) She usually just goes right back to sleep, but now might realize she has the option to actually get up and get out of bed if she wants. I expect there will be many overnight trips back and forth between her room and ours over the next few weeks. But I'm sure she'll soon get it.